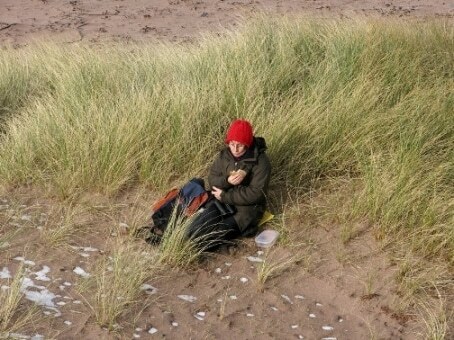 On 24th February, six members of the Field Club gathered at the Clashnessie beach car park at 1130 hrs. 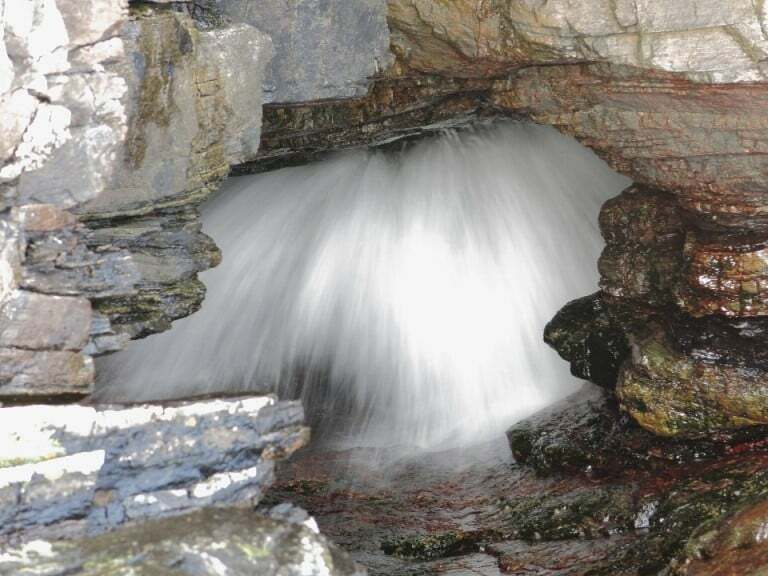 for another contribution to the Assynt Seashore Project. Present were David and Avril Haines, Chris Puddephatt, Gwen Richards, Roz Summers and myself, with the Summers family’s new collie pup Bean stopping us all from getting too serious (Photo 1). Our main aim was to look for the cowries which have been found at Clashnessie, with some general recording of intertidal life. We started with a clockwise circuit of the beach. The first find was a dead little auk high on the beach, probably from the wreck that took place late in January; it was taken away to be skeletonized. Other relics of this event, or possibly predation, were a dead common guillemot and the remains of a rock dove. Live birds logged by David and Avril on the far side of the beach included eight ringed plover, two oystercatcher and a curlew, with a raven overhead, all somewhat eclipsed by a juvenile white-tailed eagle, first spotted by Avril, making its leisurely way over just inland. 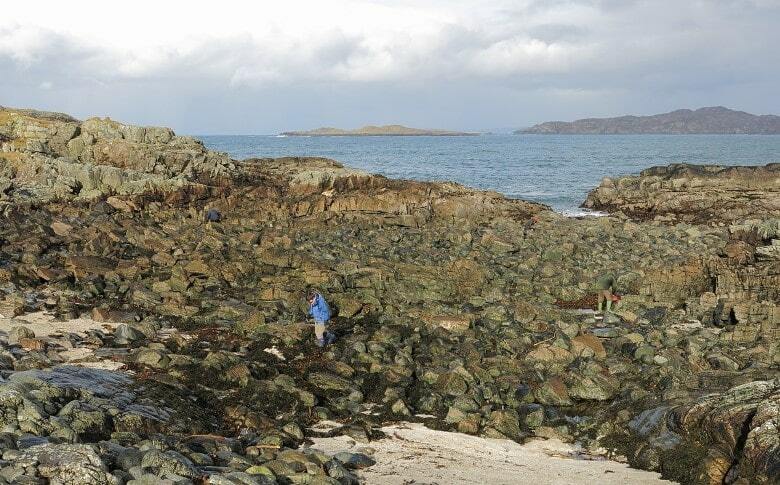 The first properly intertidal observation was of boulders buried in the beach below high tide mark that were draped with the red seaweed laver Porphyria umbilicaris. The strandline was not very productive of seashells, other than limpets, until we reached the bouldery area at the foot of the cliff in the north-east corner (NC059310). Here, some focussed searching by Gwen and Roz yielded the first two cowries Trivia monacha (Photo 3), together with a representative selection of other common gastropod molluscs, including common, rough and the two flat periwinkles, Littorina obtusata and L. mariae, grey and flat top shells, and the ubiquitous dog whelks. There were also a couple of netted dog whelks Hinia reticulata and partial shells of the painted topshell Calliostoma zizyphium. The bivalves provided more surprises; largest by far was a single shell of the Portuguese oyster Crassostrea gigas, presumably from a local attempt to farm this alien species. 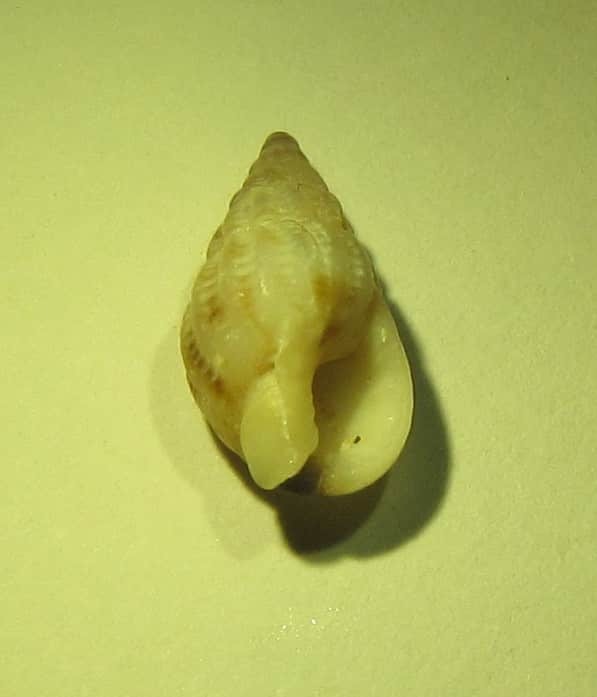 There were fragments of pod razor shells Ensis siliqua, some saddle oysters Anomia ephippium, and just one shell, found by Gwen, of a species new to us, the hunchback scallop Chlamys distorta (Photo 4). Amongst the smaller bivalves were two other less familiar species, the almost perfectly circular Diplodonta rotundata and one of the nut shells, possibly Nucula nitidosa. 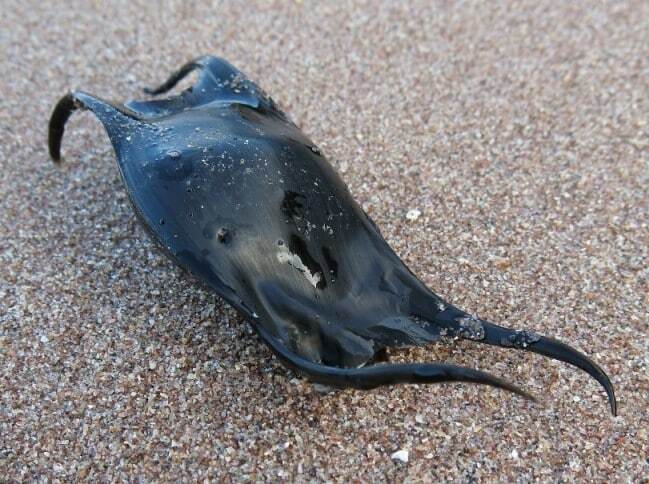 On the way back to the carpark for lunch, old strandline debris provided three large egg-cases of the spotted ray Raja montagui (Photo 5). 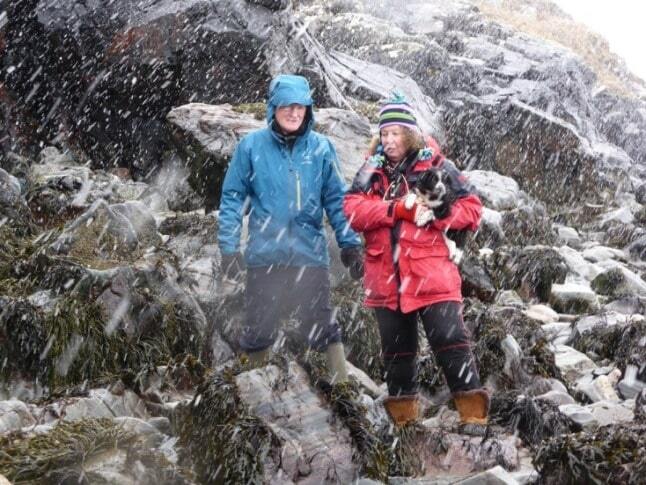 Lunch was taken on the edge of the beach in a sunny interlude between occasional sharp snow showers which we watched approaching inexorably from the north-west (Photo 2). After lunch Roz left with Bean, who had had a long enough outing in unfamiliar surroundings. The remaining five of us made our way across the mouth of the river and then along low cliffs to a large boulder beach famed for its cowries (NC056313) (Photo 6). This is a very different environment from the sandy beach for which Clashnessie is famed. 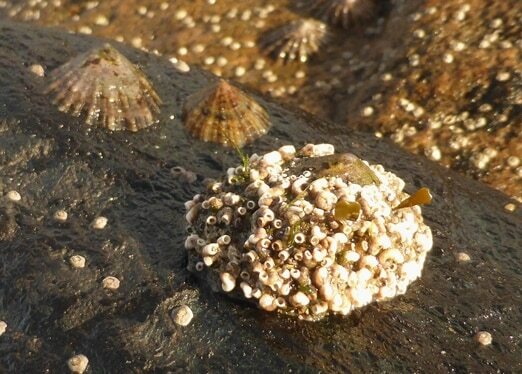 There were substantial amounts of washed-up wrack and kelp and a good selection of the usual brown seaweeds in situ lower down the shore, including young fronds of dabberlocks Alaria esculenta attached to a limpet shell. 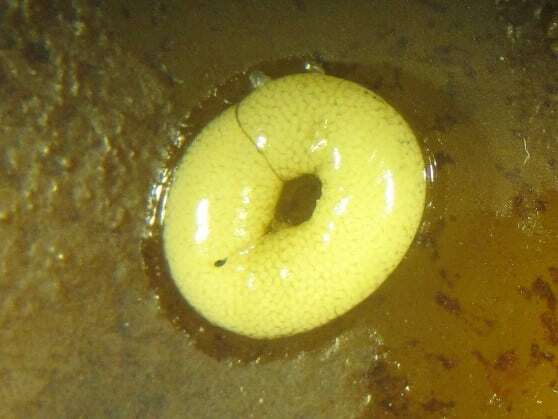 Another limpet was completely encrusted with the calcareous cases of tube worms (Photo 7). Sustained searching of sandy patches higher on the shore by David and Chris yielded two more cowries. 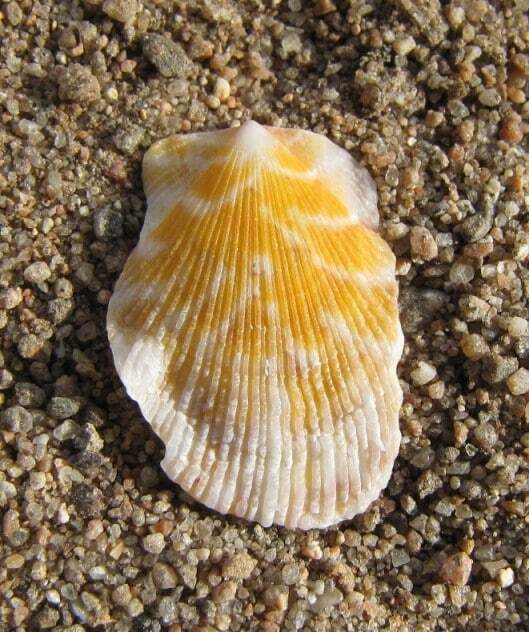 Elsewhere on the beach, pools were crammed with assorted shells of all the common species. 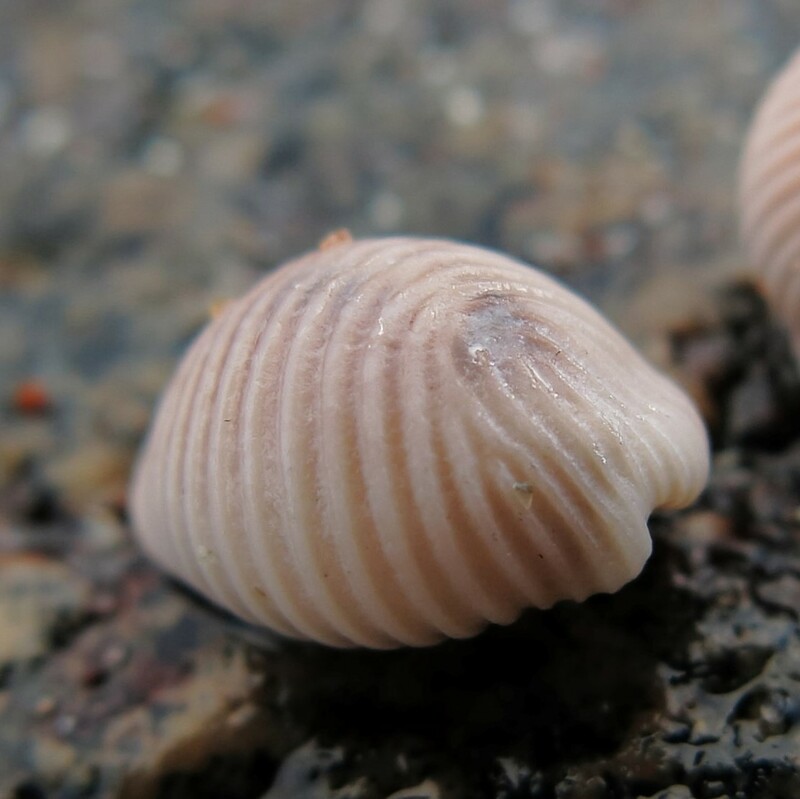 We had both sub-species of the blue-rayed limpet Helcion pellucidum, the archetypal thin-shelled colourful sub-species pellucidum, which inhabits kelp holdfasts, and the much thicker-shelled sub-species laevis, which is found higher on the shore. 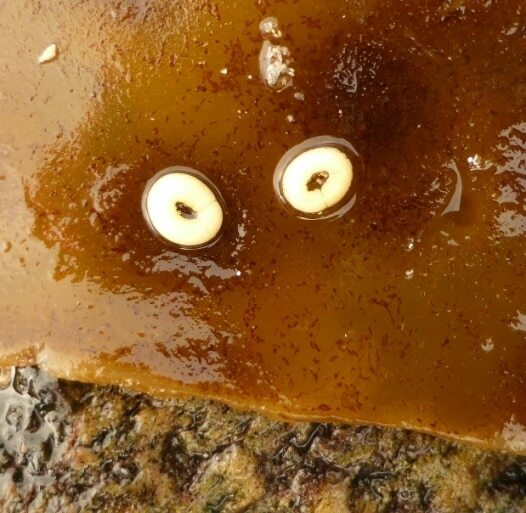 Gwen found two small egg-masses on a frond of kelp, which may be those of one of the flat periwinkles (Photos 8 and 9). There were more painted top-shells and, well-spotted by Chris, a 1cm long example of the thick-lipped dog-whelk Hinia incrassata (Photo 10), an addition to our recent local lists. 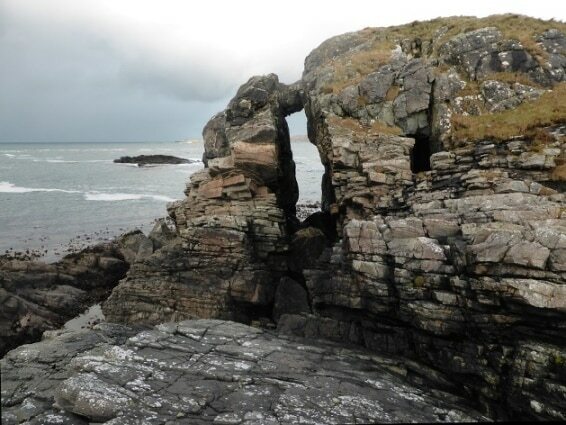 Pleased with our finds, we treated ourselves, after another cold shower, to a visit to a striking feature of this rugged stretch of coast, the blow-holes, which are situated in an impressively distorted and fissured area of the Lewisian gneiss (Photo 11). By now the tide was low and they weren’t actually spouting, but the booming clouds of spray generated by incoming waves was nevertheless impressive (Photo 12). We then returned to the cars for a welcome mug of tea or coffee and warm-up, after four hours very enjoyable beach-combing.